The Dutton Epoch release of two substantial works for soloists and chamber orchestra, plus a major work for large chamber group, brings the tally of McCabe CDs so far this year to three. 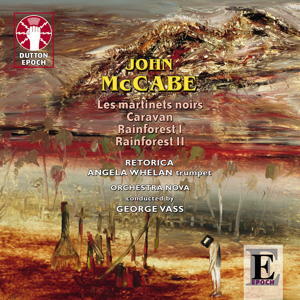 John McCabe's innate sympathy with the natural world stretches, in this CD, from high summer in England, via the deserts of Arabia, to the majestic mysteries of the sub-tropical rainforests of Australia, with their buzzing insects and strange bird-calls. Martinets noirs is the French name for swifts. McCabe describes them as 'acrobatic pucks of the air', adding that one of his annual delights in summer is to watch them wheeling about in the stratosphere, and then swooping down around trees and chimney pots. The swifts' screaming call, like children at a fairground, seems to suggest sheer joy in movement, and it is a sad moment when summer begins to wane, and one looks into the sky for the swifts, to find they are there no more. Violin duo Retorica (Harriet Mackenzie and Philippa Mo) excel as the acrobatic swifts, while Angela Whelan (trumpet) personifies the spirit of the rainforest in Rainforest II. In Rainforest I, a brilliant chamber group is joined by John McCabe on piano in a large-scale work redolent of the sights and sounds of the rainforests of Queensland. They, and the hand-picked Orchestra Nova, perform superbly under the sympathetic baton of George Vass, in this CD, which is rounded off with the short string orchestra work, Caravan, inspired by the sight of a caravan approaching, in the Arabian desert. 'McCabe's splendid concerto opens with a jovial aviary celebration of life. II depicts the amorous couplings of the birds at rest, and the finale resumes their soaring flight. Violinists Harriet Mackenzie and Philippa Mo, who call themselves "Retorica", play with infectious enthusiasm. The piece certainly deserves exposure in this country. [In Rainforest II] Trumpeter Angela Whelan is an exceptional player and a convincing advocate for the work. '... a helter-skelter three-in-one design for two violins and strings, inspired by these "Pucks of the air" (to quote McCabe). Under George Vass’s strong direction, the fine violin duo Retorica deliver a measured account, 2 minutes longer than the Amsterdam Sinfonietta’s first performances, but with no want of excitement or virtuosity. [Rainforest II] is a gripping 23-minute trumpet concerto ... Angela Whelan is the commanding and nimble-lipped soloist ... buy this disc to hear another side of one of the most purposeful voices in British music.